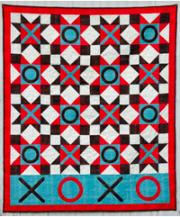 Simple piecing, large single patch vertical rows, and machine applique make this quilt sew up quickly. Playful colors add pizazz to any room! Finished size approximately 63" x 81". 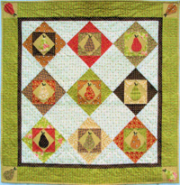 Project was made with Sewing Room Social Fabric line designed by Jacquelynne Steves for Henry Glass Fabrics. 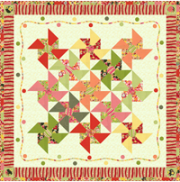 * IMPORTANT: Patterns provided on FreeQuiltPatterns.info may not be distributed on other websites or blogs or sold individually in stores without prior permission from the designer of the quilt pattern. 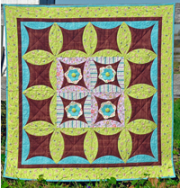 Links to FreeQuiltPatterns.info are appreciated. 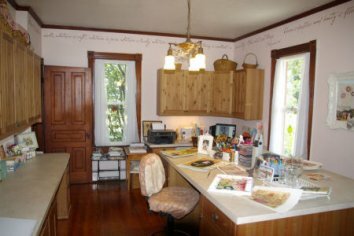 I have tried just about every creative hobby- I have painted with acrylics and watercolors, sewn clothing, done cross stitch, and taken pottery classes. About 10 years ago, a friend of mine and I saw a sign for a quilting class, and we decided that it was a good excuse for us to get together once a week for some “girl time.” I have been hoarding fabric ever since! And now, because I design fabric for Henry Glass & Co. I get to combine my love of painting watercolors and fabric collection, which is really tons of fun. I really enjoy just hanging out with my family- our favorite Friday night activity is eating pizza or Chinese take-out while watching a couple of rented movies. Nobody can make me laugh like my kids do- I find them to be highly entertaining! While my mom and grandmother both sewed clothing, I didn’t grow up in a quilting family. 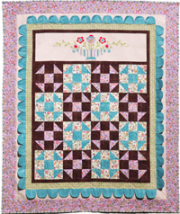 I didn’t know anything about quilting until I took that first class 10 years ago. But my grandmother and great- grandmother both did a lot of crochet… I remember sitting on the sofa next to my grandmother at her house while she taught me to crochet, and I have several afghans that my grandmother and great-grandmother made for me. A couple of them are over 40 years old. 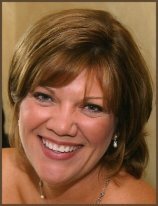 My husband and I have been married over 21 years, and we have 2 daughters, ages 15 and 20. Our very mischievous black cat Maddie graciously allows us to live with her in a 160 year old farm house.